When we first start working with polymer clay, we see the creations in the books or on Pinterest or Facebook and we figure we ought to be able to get the same results. So we get out the clay and start to create. It’s easy to get caught up in “creative fever” and rush off to bake our pieces. When they come out of the oven, though, we start to notice little marks and flaws. It’s those little bumps, dings, marks, and fingerprints that cause many new clayers to be very frustrated, wondering what they did wrong. These marks are unavoidable to a certain extent, and while you can remove them by smoothing before baking or sanding after baking, for some types of creations you will find it far easier to build texture into your design. You can create a texture to hide and camouflage the flaws in polymer clay. No matter how hard we try to be neat as we create with polymer clay, we all have to deal with the normal flaws that seem to magically appear on the surface of our clay as we work. Here are some common types of flaws that show up in polymer clay. Even when you’re very careful that you don’t accidentally fold air bubbles into your clay as you work with it, you can still end up with tiny bubbles. I’ve seen them called “The Bumpies” or “polymer acne”. Often these small bubbles are invisible to the eye when the clay is raw and only rise to the surface when during baking. You can minimize them by baking face down, by the way. But that’s not always practical. Our fingers have these annoying little texture stamps on the ends of them, and they’re called fingerprints. And there is a little knife on each finger called a fingernail, too. Even when you keep your nails clipped short, they still have an annoying habit of digging into your work just when you are almost done. You do get better at avoiding fingerprints with practice, but applying a uniform texture to a surface hides a lot of flaws and makes your work look far more polished, finished, and professional. You can use sandpaper to create a uniform texture on open areas of your work. Sandpaper is a simple and easy way of texturing to hide flaws in polymer clay. It’s readily available, inexpensive, and comes in a range of coarseness. The lower the number, the more coarse the grit is. You’ll find that sandpaper from 24 grit to around 220 grit will give texture that will hide flaws in polymer clay such as fingerprints and “the bumpies”. While any type of coarse sandpaper will work, you’ll find that uncoated sandpaper can sometimes leave particles of grit in your clay. Because of this, look for coated sandpaper if you can find it. The two smaller pieces in the picture above are both coated. The grit particles will stay attached to the sandpaper. To use sandpaper to disguise flaws in polymer clay, just press the textured side into the clay repeatedly until it looks the way you want. Sometimes you want a very subtle “sprinkling” of texture. Other times you might want it to be quite choppy and coarse. Use a sandpaper texture that matches your desired finish. Texturing the back of pendants in this way not only avoids the dreaded “shiny spots” from baking on a smooth surface, but it also works well to disguise fingerprints and other little marks and dings that happen when working with polymer clay. The key is to create a fine, uniform texture to camouflage the unwanted marks. Tip: To prevent the shiny spots on the back of clay that come from baking on a tile, bake on a sheet of copy paper or an index card. And don’t worry, the paper won’t burn. You can use any number of things to create a fine, uniform texture. I’ve already showed you sandpaper, but here are some other things that you’ll likely have around the house that can be used for this purpose. You can use a kitchen scrubby, a glittery kitchen sponge, a Scotch-Brite pad (mine is blue, but they usually come in green). Another cool kind of texture are the thin sheets of sponge filter material that are used in air conditioners. The black one I show here is very fine, but the larger-celled green foam sponge was sold as a liner that goes in the bottom of your produce drawer in your fridge. You can also use cloth such as canvas, an old t-shirt, or a piece of washcloth. Toothbrushes work nicely, too. There’s really no limit here. You can use anything with a texture. I sometimes even use paper when I want to super smooth finish. That’s kind of anti-texture, isn’t it? Most of the time the clay doesn’t stick to these texture tools. But if it does, you can clean the clay off the texture tool by using rubbing alcohol. We all know how to use stamps. The whole idea is that you press down and it makes an image or a texture. And ideally, you only press down once because if you wobble and do it twice, you get ghost images and it looks sloppy. But what if you “get sloppy” on purpose? Just tap the stamp up and down a whole bunch of times to create an abstract and random texture. And it doesn’t have to be rubber stamps. You can do this with fine detailed stamps as well, such as the KOR stamps. In fact, leather stamps work really, really well for this! Here’s my set of leather stamping tools. I bought them from Amazon very cheaply. (Read here about finding cheap polymer clay tools.) Here’s what happened when I used a simple round leather stamping tool on a sheet of polymer clay. How’s that for a nice uniform and random texture? The leather stamping tools are really effective for this method because they’re quite heavy and the weight of dropping the stamp onto the clay helps to create the design. Here’s the whole set of leather tools that I have. All sources of these tools seem to have the same 20 designs. Check Amazon or Ebay. There are some more suggestions in my article about finding cheap polymer clay tools. These 8 squares each have a texture that could be used for texturing polymer clay backs, and each would disguise fingerprints and hide marks. But each one has a different character and would compliment a very different themed work. (I highlighted them with mica powder so you could see the texture, but you don’t have to use mica powder on your textures.) You can click on the picture to make it bigger so you can see the textures better, btw. Here are the textures I used to create the tiles in the above image. That roller there is a wooden KOR roller provided by Poly-Tools. These Holo Tiles (made with my Holo Effect Tutorial) were finished by texturing the backs with a kitchen scrubby. When I reviewed the CaBezel All-in-One Molds last year, I made this and textured the outer green part with an oven mitt and toothbrush. Otherwise the clay itself would have shown every bump, especially with this frosty color. Here, the blue background was textured using a toothbrush. You could also use sandpaper or a kitchen scrubbie. The backs of these pendants were textured with a leather stamping tool. I just tapped the tool repeatedly over the raw clay until it formed a random, uniform pattern. A texture doesn’t have to completely fill an area to be effective. I textured the backs of these tiki earrings with the round sandpaper disc (24 grit) seen above. It makes it look like old, worn stone. The tikis were molded from this mold from Best Flexible Molds. I made this tin at a Lisa Pavelka workshop. It features a Sutton Slice top and the lavender areas were textured with sandpaper to hide fingerprints. So…what have YOU used as a fine texture like this? What’s your favorite go-to tool for disguising fingerprints and the inevitable little bumps and marks that always seem to happen with polymer clay? Please share your answers in the comments so we can share ideas and learn from each other. Thanks! Do You Like Clearly Written Tutorials? My tutorials are well known for being very clear, detailed and easy to follow. Have a look in my tutorials shop and see if anything tickles your fancy. 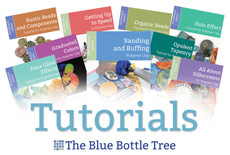 I would love to help you learn a new polymer clay skill! Lots of fun ideas here! I really should try those leather stamps, they’re sitting in a corner of my tools cubby. Coarse sandpaper is one of my favorite texture tools. My other favorite is the finest Clay Yo sponge which is similar (if not the same) as the air conditioner filter sponge? The reason that’s my favorite is that I can run through my pasta machine at a very thin setting and it doesn’t get crushed or anything. I don’t do that with the sandpaper because I’m sure it’d scratch my rollers at that setting. Hi Ginger, great post and I agree with Krithika that the three Clay Yo sponges are wonderful too. They don’t seem to get dirty like kitchen sponges. I also like the effect of rock salt and bark. The rock salt can give a lava like texture. I just roll the raw clay beads in the salt and then it may or may not stay on the bead but washes out afterwards. I use a favourite piece of bark for making ageing marks on faux coral. The other really nice one is old pens which can be broken apart to give lots of little circle making and pointy bits! Finally, one I do use a lot is the base of shavers which often have interesting squarish shapes. Thak you for sharing, as always, your wonderful experiments and creative play! Great post Ginger, especially for helping new clayers as lots of times I see posts on Facebook, etc. where it is obvious they have put a lot of effort into a piece but you can see the unsitely marks on the smooth clay. My favourite is stair safety stripping (it comes in a roll) here in Canada. It too can go through the pasta machine on the thickest setting. Newbies should be warned to spritz with a little water first though so the clay doesn’t stick. Fingerprints, the bane of a lot of clayers, can also be your friend. Lightly touch your piece with your fingertips all over, overlapping your touches, so that the whorls of your fingerprint blend together. No distinct fingerprint…. just a bunch of fine lines. Great ideas, Ginger! I’ve been using fabric for many years to texture the backs of my polymer pieces… and that and varioue other things to texture the fronts, id needed! I’m learning a lot from your blog. I have worked a lot with polymer clay, yet this is the first time I’ve heard the tip of baking it on a piece of paper to avoid shiny spots. Good to know. Thanks. Hi, Ginger, great post! I’d love to see more information on using a blank piece of paper. Is it like burnishing on deli sheets? Two of my favorite texture tools are old dog brushes. One is metal and you can make some very deep holes in the clay if you want. The other one is plastic bristles. They both have handles and make pouncing on the clay very easy. Here’s my article on using copy paper with clay. Like I said in the article above, I use as a baking surface. But I also use it to give a smooth, uniform texture to a flat sheet before I do other things do it. Just lay a sheet of paper over a sheet of clay and rub back and forth with an acrylic rod. It flattens the sheet and makes a “non-texture”. Clay acne…..I’m sure I learned from Judy Belcher (but my memory isn’t so good these days!) in a class to stretch the clay slightly just before each roll through on the pasta machine, and to alternate the fold from the bottom to the side with each roll through. I’ve found that over the years I pay more attention to the clay and look for the tiny blebs as I’m conditioning, and I don’t get many bubbles now. I’ve always wondered why when I bake a clay piece against a tile, the back forms “shiny spots” rather than being shiny uniformly. I was trying to get a really shiny surface, but after a few tries I gave up and followed your suggestion of using copy paper or sandpaper (pieces of advice I’ve seen you mention elsewhere in the blog, but only recently started following) since things look “neater” that way. I guess the only way to get a shiny surface is through sanding and buffing. Thank you once again for taking your time out to write this thorough and helpful guide. I love your various suggestions. I often use a piece of lace to texture the back of the item. It gives a lovely effect when I use acrylic paint and wipe it off. the paint remains in the grooves and gives a lovely effect. Thanks for sharing your wonderful ideas. I bought the leather stamping tools at your suggestion and have found lots of uses for them. I love your articles Ginger as i am always learning so much from different sources and your’s is one of my favorites. I accidentally came across card stock from Joann’s or Michael’s. Many of them have textures on it and I found this out by using it to bake my pendants on and when they were done baking I was surprised to see the textures on the back so now I press them a little firmer and it works fantastic. Thanks again for the work you do for us. I check out my local wallpaper store regularly for those large binders they discard. The textured wallpaper ones are great. The pages can be cut up and applied to well conditioned clay. I find the textures flatten sometimes if put through the pasta machine. The really unique ones I like or use regularly I make a mold. Thank you for all the suggestions. I always love using sandpaper. Also seashells and old chicken bones. Great post, Ginger! Besides some of the techniques shown here (some I even learned from you), I made a football pendent for a friend and used a small piece of vinyl shelf liner for the perfect “football” texture. Good, I’m so glad that it was helpful! Hi may I know how you get the texture for the 8 squares? The next picture has the items labelled with numbers. Your articles are very well written and easy to absorb. Thank you Ginger, for enriching the world of polymer clayers. Great article and reassuring to know we are not alone. I save the foil lids from yoghurt and other pot foods. There is often a very fine pattern and they are perfect as a base for putting together several elements that you dont want to move before baking … and you can turn them easily to continue working on the piece. I can also lightly roll over the finished piece to ensure the front is flat or add decorative top texturing without disturbing the back. A fine dusting of talc or water to ensure they come off easily … but putting them in water after will help remove the foil. Scrunched foil works too … smooth out again for a finer texture. And as mentioned before, plastic fruit netting gives a nice diamond finish front or back. I have not worked with polymer very much as it has always looked too plasticky when I have . I was curious about a piece I recently saw online that almost looked like felt but was gradated, so I wondered how that could be. Well, I may never get that accomplished but I am astounded and delighted after reading your post as I have hopes that I might try this stuff again! Thank you!